It doesn’t matter if you binge on food once a week or multiple times a day. It doesn’t matter if you are overweight, underweight or normal weight. If you find yourself uncontrollable around food, you are in the right place. We can help you. We’ve written two successful book(s) on overcoming disordered eating and we’ve been coaching recovery since 2008. We specialise in coaching people to end their struggle with binge eating, overeating and bulimia. We help them get off the roller-coaster of guilt, shame and food obsession. We help them make peace with food and end body weight fluctuations. We have a high recovery success rate. Our books are some of the best reviewed books within their field with an incredible 96% approval rating on Amazon.com. Over the past 10 years we have helped thousands of people recover. From the diversity of people and recoveries we have witnessed over the past few years, we believe that without a doubt no one is beyond help and that there is no such thing as being too weak or too broken for recovery. We believe our unique approach to treatment is at the forefront of a groundbreaking revolution in eating disorder recovery. We focus on simple, practical, easy to follow steps that have been proven to work (we love science based studies). We are recognized authorities: We are best selling authors. We are endorsed by University Professors, Eating Disorders Specialists and Doctors. We have been featured in many leading publications, including Psychology Today, The Telegraph, and have been referenced in other leading Eating disorder books about recovery. You’re not just another client: HealED Coaching is a highly personal service. You get your own personal HealED coach, a real human who will be there for you from start to finish. Your coach will guide you gently, with kindness, compassion and understanding, step by step, towards a full recovery. Each of our HealED Coaches are knowledgeable, dedicated and passionate about what they do. We know what we are talking about, because we have been there too: Not only are all our coaches highly qualified, all of our coaches have suffered with eating disorders first hand and have fully recovered. They understand the pain, the loneliness, the challenges, the struggles, because they’ve been there too. There is no-one more experienced or better to have in your corner. We guarantee our work: We offer a 7 day money-back guarantee. If you feel your coach isn’t a good fit for you, you can request to change your coach, or alternatively we will offer you a full, prompt refund. We teach you valuable skills you need for life-long freedom: The end goal of HealED Coaching is to teach you the skills for lifelong recovery. Think of us as training wheels on a bicycle. After a while, once you get back in balance and build your confidence you will no longer need our support. Our service is 100% private and discreet: We take your privacy seriously.￼ We will not send anything to your home address. The words “Bulimia” “Binge Eating” or “Eating Disorders” will not appear on credit card/ paypal statements. HealED was founded in 2007 by Alison Kerr and her husband Richard Kerr and it now has a team of coaches located across the world. Ali suffered crippling bulimia for over 10 years, bingeing and purging up to 10 times a day, obsessed with food and deeply concerned for her long term health. Ali then made a commitment to recover, no matter what. Today, she is a bestselling author, has helped coach thousands to recovery and teaches her simple, practical recovery method around the globe. In creating HealED, we have built a company that we wished existed when Ali was seeking recovery. As a company we have grown entirely by word of mouth. 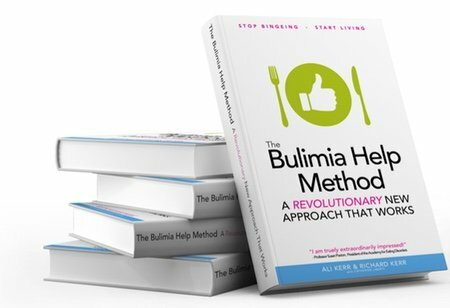 Our first book, The Bulimia Help Method is a proven & trusted approach to lifelong recovery from bulimia. The Binge Code is our new book based on over 10 years of helping people end their binge eating issues and lose excess weight. “I’ve worked with thousands of people and I am more convinced than ever that it doesn’t matter how long you have had an eating disorder or how intense it is, you CAN recover. My goal, and the goal of all of us at HealED is to help show you exactly HOW you can recover from your eating disorder. That is, to help you get to a place where your body no longer craves or wants to binge or purge on food. Where food becomes just food and nothing more. This isn’t just a platitude. This is very achievable and we’re committed to helping you any way we can”. This is YOUR coaching. Your coach will cater to your individual needs, to find the best strategies that work for you. Your coach will guide you only at a pace and speed that is right for you. We focus on providing you with practical, sensible, proven strategies that work. You and your coach will work together to apply changes to your life that will make a REAL positive difference. We understand that no two recovery journeys are alike. Your progress will not be compared against others. You will not be judged for any set backs or relapses (besides we know setbacks are an important part of the recovery journey). Your coach will not treat you as though you are weak, faulty or broken in any way (because your not). Your coach will not blame you, your past, nor your family for your eating disorder (it’s not your fault!). No guilt, shaming, or judging. No forcing you do to ANYTHING against your will. Ever. No tricks to make you eat more or gain weight. Work with someone who seeks to understand your situation and then gives sound recovery advice. Be in a safe environment free from judgement, were you feel comfortable expressing your honest thoughts and feelings. Receive a service that’s efficient, productive, and professional. Maintain regular contact with your coach. Be serious about wanting to recover. Be prepared to make significant changes to your lifestyle. Provide feedback, both good and bad. If you’d like us to coach you through your recovery – you can sign up here.